When the going gets tough, the tough lie down. 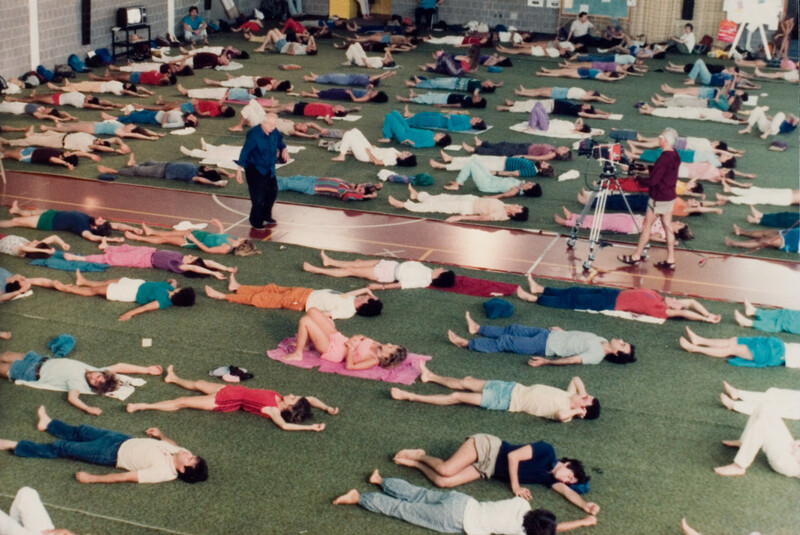 Moshe Feldenkrais teaching his method in Amherst, MA (1980). © INTERNATIONAL FELDENKRAIS® FEDERATION ARCHIVE. Does keeping up with the news give you whiplash or a growing sense of dis-ease? Has your life been interrupted or upended by a natural disaster or otherwise taken an unexpected turn? If there is something that anyone can do to improve their ability to respond to life’s inevitabilities and its vagaries, it’s finding a practitioner of the Feldenkrais Method and taking an Awareness Through Movement class. Lying on the floor and moving slowly, with awareness but without a goal, might seem counterintuitive if not a waste of time to those who are accustomed to vigorous, purposeful or measurable action or who are motivated by a sense of urgency. Yet Feldenkrais lessons, guided by a teacher’s verbal instructions are, surprisingly, a direct way to inhabit one’s body and one’s life more fully, no matter the level of challenge. Lying down could very well be the first step to standing up for oneself in an uncertain world. Many of us are conditioned to respond to stress or overwhelm by fighting, fleeing, or freezing, or some sequence or combination thereof. These unconscious choices might offer a reprieve or a sense of accomplishment, but they are not empowering over the long term. The Feldenkrais Method helps us develop the capacity to respond with greater skill to changes in our circumstances or surroundings by first quieting the nervous system to an unfamiliar degree. That allows us to notice subtle differences in how we move, feel, think and, therefore, how we go about our lives. While many people, myself included, only stumble across Feldenkrais when an injury, chronic pain or another treatment-defying condition leads us to it, this modality will help anyone discover how much they can trust their bones and themselves. Learning to rely more on the skeleton for movement, even the prosaic act of getting out of bed, frees up vitality siphoned by muscling through life or bracing oneself against actual or perceived difficulty. In a culture whose mantras include “no pain, no gain” and “work hard, play hard”, it can be surprising to learn that radically less effort can lead to dramatically better results. One can move quickly without rushing or adding tension, leaving more energy to pursue what matters. In a culture whose mantras include “no pain, no gain” and “work hard, play hard”, it can be surprising to learn that radically less effort can lead to dramatically better results. With the world in flux, the roots of the method remain pertinent. Having fled turmoil and fascism and trained in the martial arts, Moshe Feldenkrais knew in his bones the importance of being able to reverse one’s movement to avoid injury or death. He skillfully and subtly translated “reversibility” into his repertoire of movement lessons, which address human functioning in organic and even playful way, without emphasizing performance or poses. Indeed, learning how to sit down and get up from a chair so that I could reverse direction throughout the trajectory, without thunking into the seat, clenching my leg muscles or using my arms as support, taught me directly that much of my movement had been a lopsided dance of excessive effort and collapse. Learning how to distribute effort across my skeleton made movement lighter and easier, a state change that felt nothing short of astonishing, as if I’d been handed a new body and a new lease on life. As Dr. Feldenkrais once said, “What I’m after isn’t flexible bodies, but flexible brains.” By spending time on the ground cultivating that flexibility, we might surprise or surpass ourselves in moments of challenge. For those of us whose lives are not on the line, we can learn to embody ease and engage with difficult circumstances, whether personal, societal, or global, in ways that don’t deplete us. The beauty of the Feldenkrais Method is that, as an educational modality, it doesn’t try to fix anyone or solve “problems”. As Moshe Feldenkrais explained, “The object of this learning is to remove outside authority from your inner life.” With so much at stake in the world, if we all did a little Feldenkrais, it could go a long way.